"MORE THAN JUST A DOG"
Windchime Kennel is a family run kennel and we would like to thank you for your interest in our dogs. We are located near Chester, SC on a 100 acre farm. Our dogs participate in AKC, NAVHDA, and Field Trails. Our dogs have been hunted in SC, NC, VA, GA, MD, ND and OH. Windchime Kennel dogs are family memebers as well as hunting companions. 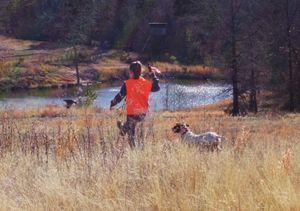 We Breed only quality hunting dogs for the best hunters and family companions. Our breeding stock all have OFA certified hips, cardio, and eyes. We produce only top quality pups that are introduced to quail/pigeions, water, and are very socialized. Our goal is to provide you with a healthy puppy that will give you joy for years to come. We futher offer a one year replacement guarantee for genetic or structural problems. We reserve the right to sell only healthy pups. We expect great hunting dogs from all the litters we produce. Here is an article AKC wrote on my Grand daughter Kayla.